From humble beginnings in 1884, this yard grew to become the second-largest in the country, and was a leader in the US shipbuilding industry for a century. 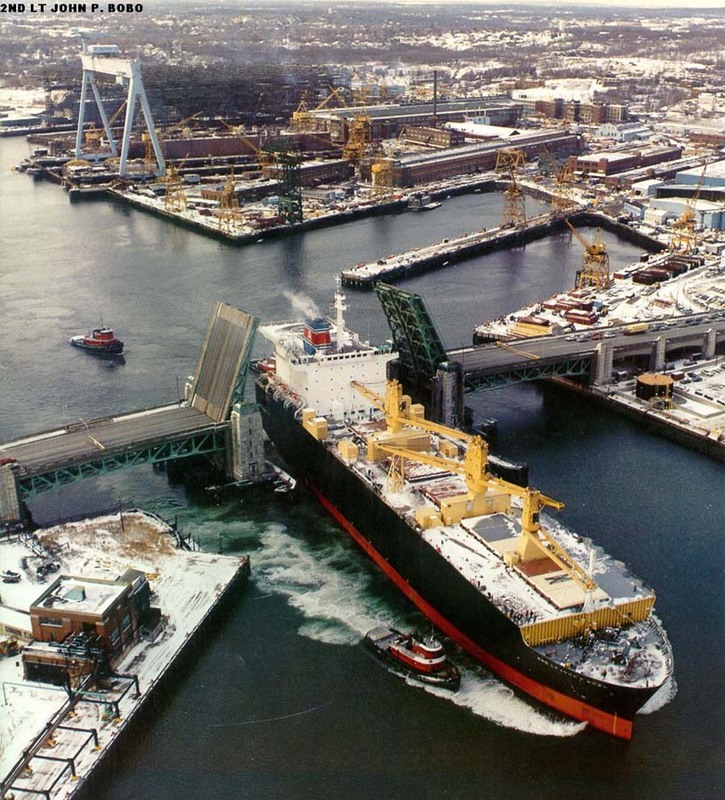 Fore River constructed hundreds of ships, ranging from freighters to aircraft carriers to LNG tankers, for customers around the world. The yard is probably best-known for its extensive work in naval shipbuilding, playing a key role in building the fleets that fought in both World Wars and the Cold War. This is the first of a multi-part feature that will document the history of the Fore River shipyard. Click on the photos for a larger version; click on links in the text for more infomation. Thomas Augustus Watson is best known as Alexander Graham Bell's assistant, but to shipbuilders he is important for an entirely different reason. 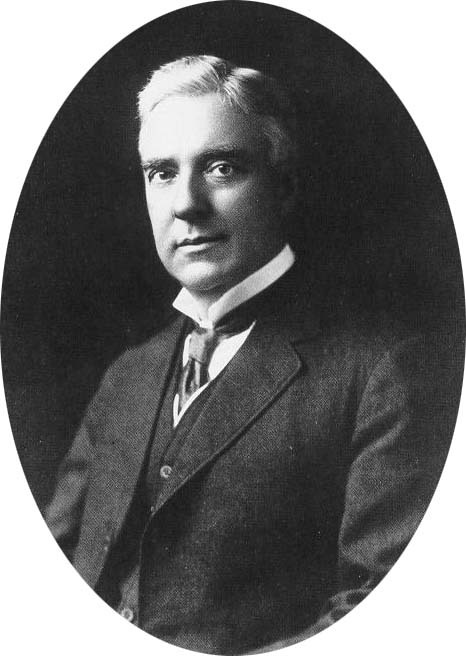 Watson left the Bell Co. in 1881, then spent a year traveling, and two years farming at East Braintree, Massachusetts. 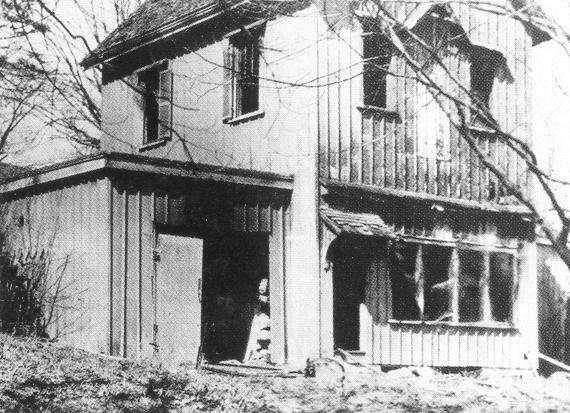 In 1884 he founded the Fore River Engine Company, initially located in this small house in East Braintree, near the Fore River. This tiny business, with only one employee, was the humble start of what would soon become one of the nation's largest shipyards. 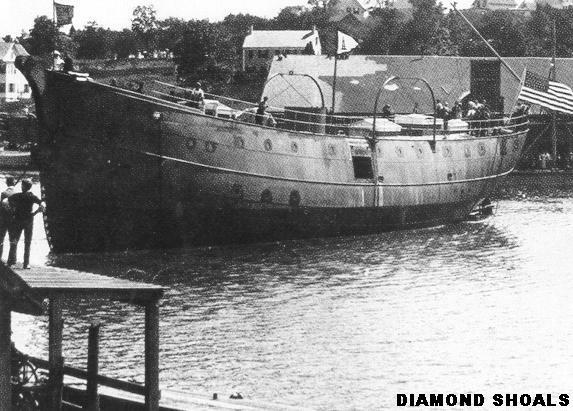 In 1900 the company launched the lightship Diamond Shoals (left), the first all-steel vessel built on Boston's South Shore, and the destroyer USS Lawrence, the yard's first naval contract. Another major event in 1900 was the groundbreaking for the company's new shipyard, two miles downriver from the old site. The new location, in Quincy, MA, was a good location for a shipyard - near the major seaport of Boston, convenient to rail and sea transportation, possessing both a sheltered, riverside location, and deepwater access to the ocean, and with plenty of space to expand. 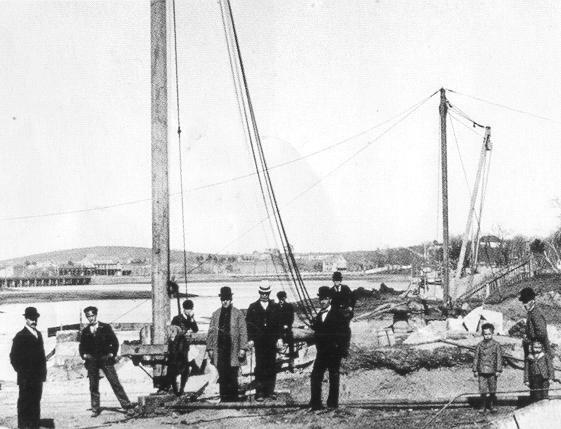 One drawback was the wooden bridge across the river's mouth, seen in this view of the groundbreaking ceremony, which kept large ships out of the river. Watson prevailed upon the local governments to fund a new bridge - and they hired him to build it! The view at left shows the company's facilities circa 1902. 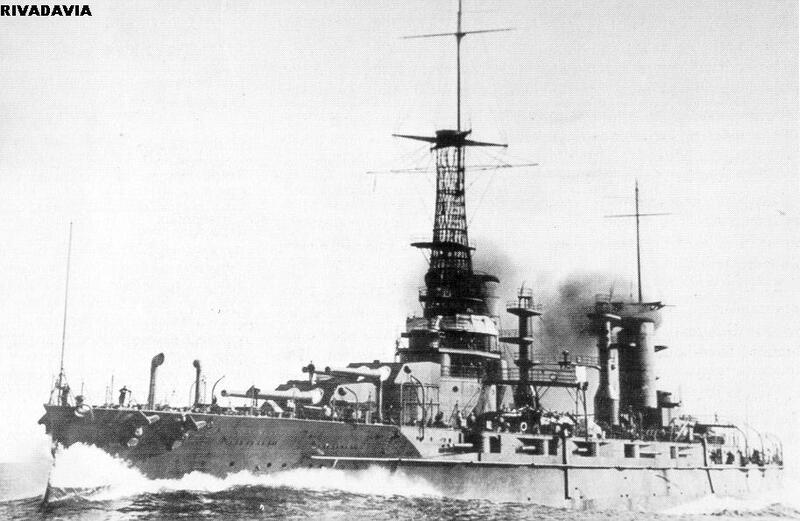 In this year the cruiser Des Moines was launched from the new yard; she was the largest vessel yet built by the company. 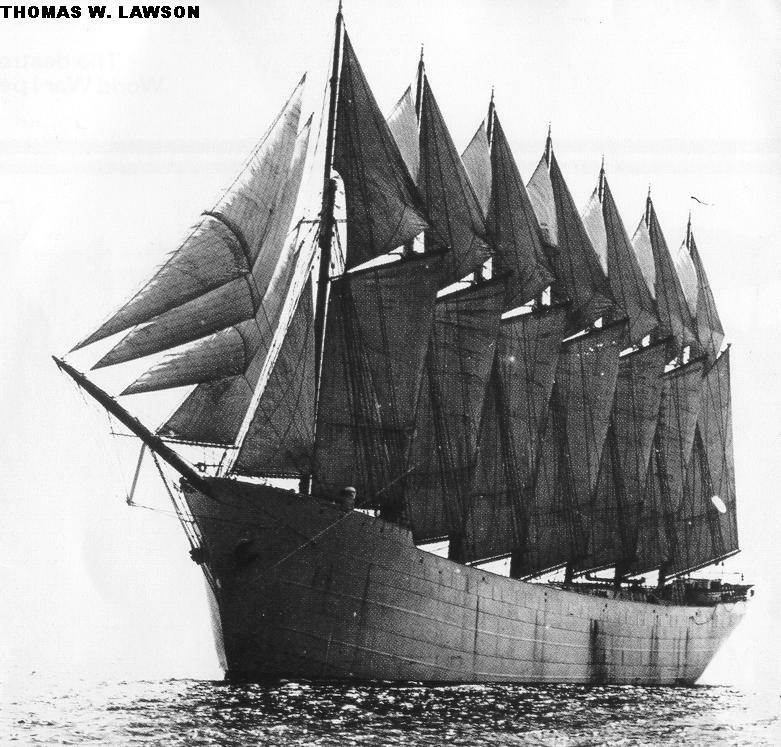 Another 1902 launching was the giant seven-masted schooner Thomas W. Lawson, the only ship of her type ever constructed. By this time the new yard, now known as the Fore River Ship & Engine Co., was a busy and growing enterprise, soon to have an even bigger role in the shipbuilding industry. In the years leading up to WWI, the Fore River yard constructed a wide variety of ships, including cruisers, destroyers, submarines, four battleships, and numerous merchant ships. To accommodate these contracts the yard continued to expand; at left is a view of the yard circa 1910, apparently from the large crane on the fitting-out pier. 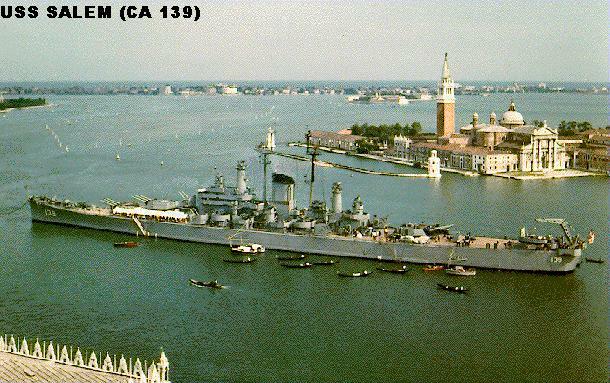 One of the four battleship contracts in the prewar years was for Rivadavia, built for Argentina (at right); she was the first Fore River vessel built for a foreign power. Bethlehem Steel had the contract to supply the steel for this vessel, and many others built at the yard. 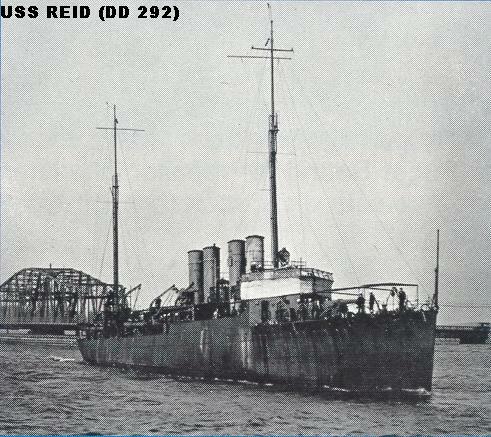 Due to concerns about Fore River's ability to complete the Rivadavia on budget, Bethlehem Steel purchased the shipyard in 1913, thereby protecting their interest in the contract, and securing a greater role in the shipbuilding industry. Now known as Bethlehem Fore River, and later as Bethlehem Quincy, Watson's yard continued to grow and prosper. 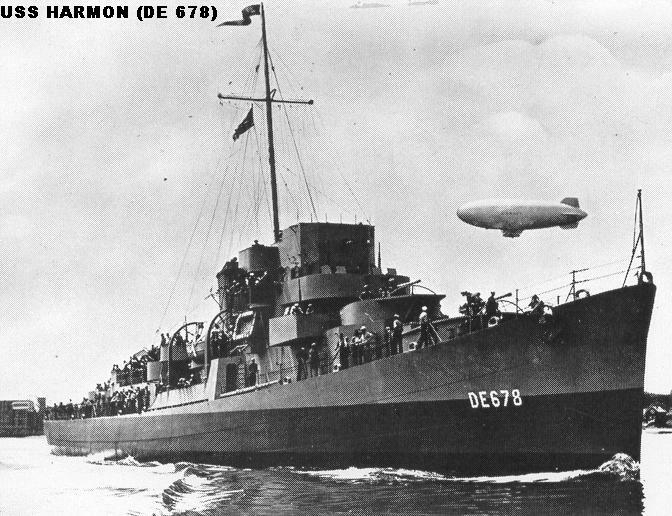 As war clouds gathered in Europe, the need for ships - especially naval vessels - increased. 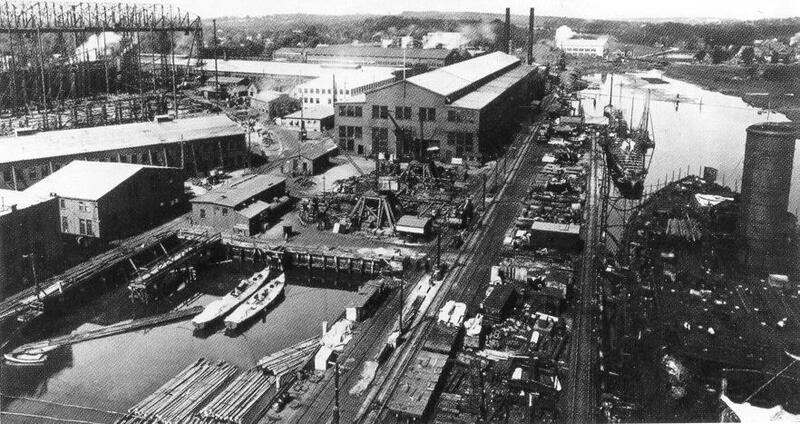 Bethlehem constructed an additional shipyard in the nearby Squantum section of Quincy, intended specificially for mass-production of destroyers, while also expanding the Fore River yard; wartime employment reached 15,000. At right is a view of the Fore River yard in early 1919, while WWI construction programs were still ongoing; at least five "flush deck" destroyers are visible along the waterfront. Together, the Fore River and Squantum yards turned in an admirable performance during the war, building 18 destroyers, 10 submarines, and 6 merchant ships in 1918 alone. In all, the yards built 71 destroyers during the war - more than the total output of all other US shipyards combined! One of the war-built destroyers was USS Reid (DD 292) (at left, clearing the Fore River bridge), built in a record-setting time of 45 1/2 days. Following WWI the Squantum yard was closed, later becoming part of a Naval Air Station; decades later the site was redeveloped as a residential community. Between the World Wars Quincy maintained a steady stream of merchant vessels and warships - cruisers, submarines, destroyers, and aircraft carriers. 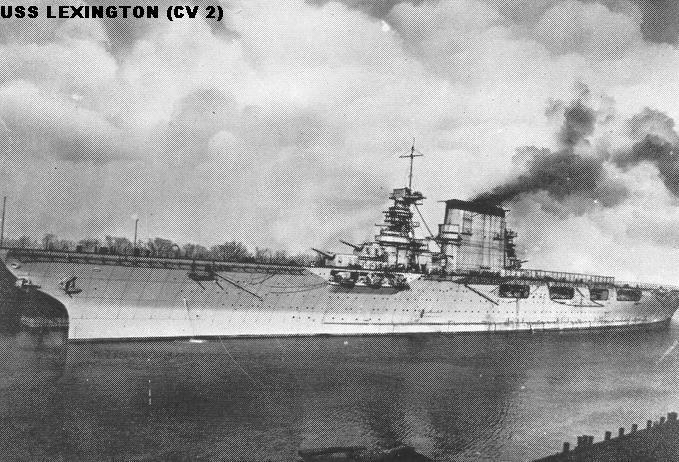 One of the largest and most important ships of the 'tween-wars years was the big aircraft carrier USS Lexington (CV 2), the "Queen of the Flattops", converted from a cancelled battlecruiser and delivered in 1927. As the first non-experimental carriers in the US fleet, she and her sister Saratoga played a vital role in building the US carrier forces that were so vital to naval warfare during WWII. 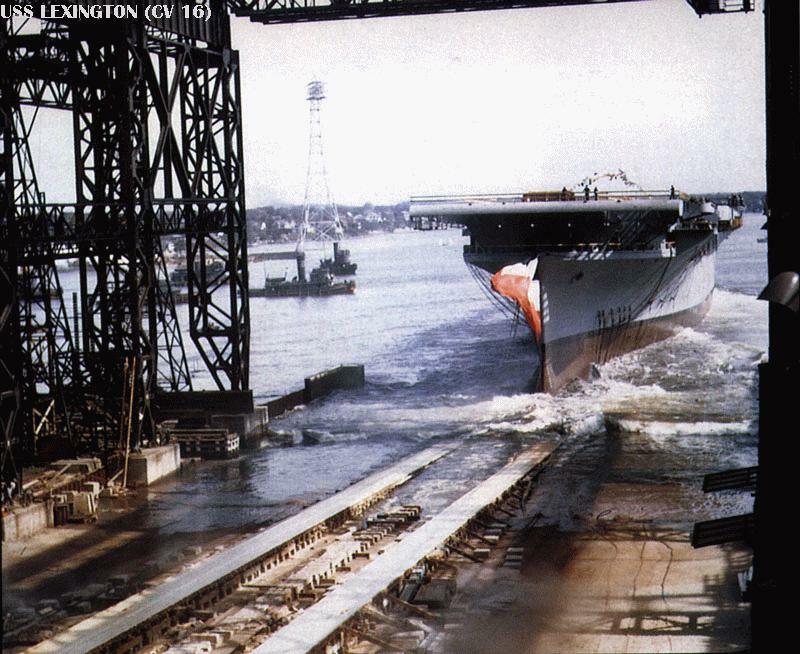 Lexington was a source of great pride for Quincy shipbuilders, and her loss early in WWII was deeply felt at the yard. Starting in the late 1930's Quincy once again stepped up production to meet the wartime challenge. By 1941 employment had already reached 17,000, and facilities were being rapidly expanded to accommodate growing shipbuilding requirements. 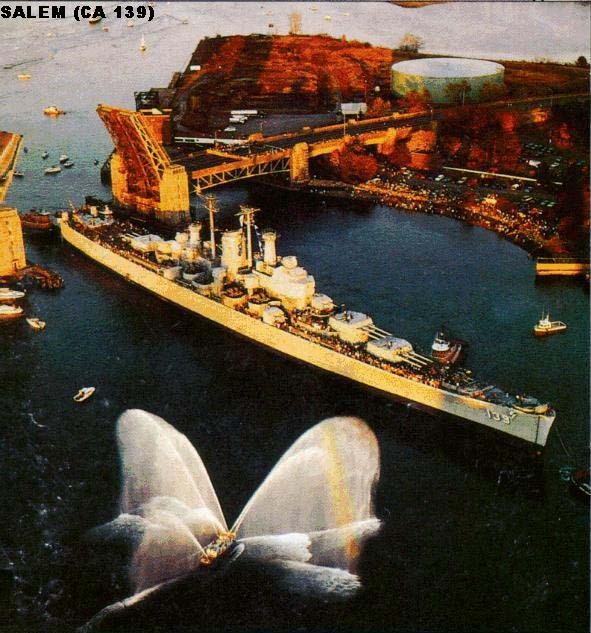 The yard turned out numerous aircraft carriers, cruisers, destroyers, and the battleship USS Massachusetts during the war. Aircraft carriers included USS Lexington (CV 16) (at left, launching), named in honor of the previous carrier Lexington, and the cruiser USS Canberra (CA 70) (at right, clearing the new Fore River bridge), honoring an Australian cruiser sunk while operating with US forces early in the war. Once again an additional mass-production yard was needed to meet wartime shipbuilding needs. This yard, located in nearby Hingham, built destroyer escorts and landing ships (LST, LCI(L)) in great numbers. These smaller, relatively simple ships played a vital role in the US victory, and were built in record time. One DE was launched just 23 days after keel-laying, and in one 50-hour span a total of 5 LSTs were delivered. Combined employment at the Hingham and Quincy yards reached 32,000 - more than double the WWI peak. The Hingham yard closed down after the war, and was eventually sold off and used for various industrial purposes. The Hingham shipyard property is now scheduled to be redeveloped as a residential community. The postwar years saw a wide variety of shipbuilding at Quincy. Naval shipbuilding ranged from ships ordered under the wartime shipbuilding programs, such as the cruiser USS Salem (CA 139) (left), to the hi-tech nuclear-powered missile ships USS Bainbridge (DLGN 25) and USS Long Beach (CGN 9) (right), the world's first nuclear powered surface combatant. 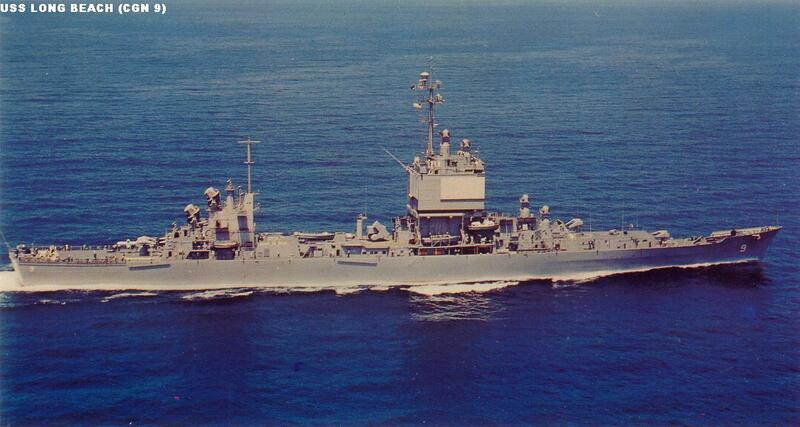 Other naval construction included destroyers, frigates, and a tanker. Commercial projects included the liner Independence (completed in 1950 and still in service today), and the supertanker Manhattan, famous for her voyage through the Northwest Passage. Unfortunately, the prosperity could not last; Bethlehem closed the yard in 1963. 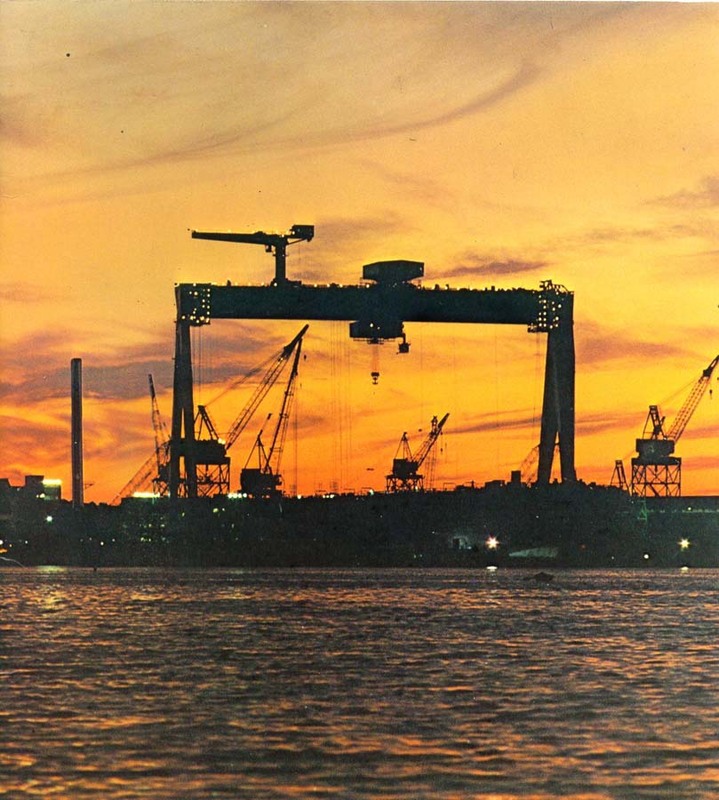 The Quincy shipyard was purchased by General Dynamics Corporation in 1964, becoming that company's Quincy Shipbuilding Division, and a "sister" division to Electric Boat. 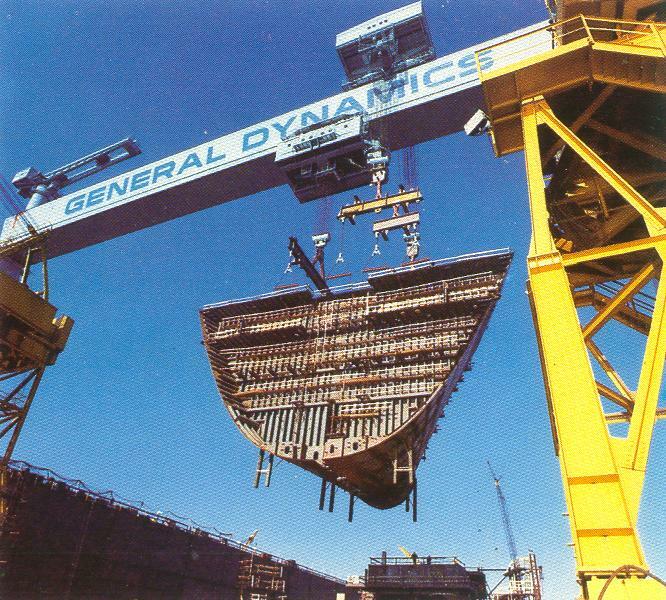 Within a few years General Dynamics invested in major modernizations of the shipyard. 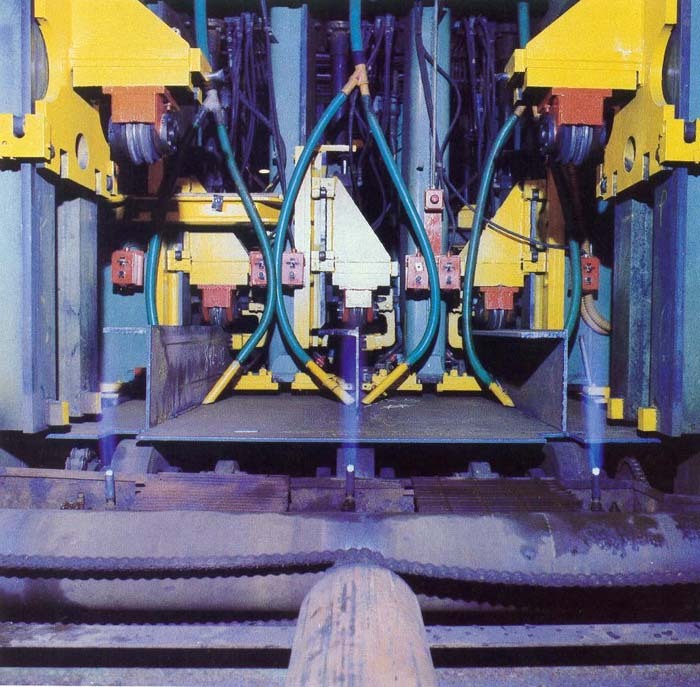 Modernizaton included replacement of the conventional sliding ways with modern construction basins, implementation of a highly automated production process, and extensive use of "pre-outfit" construction techniques. 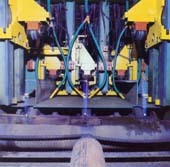 At left is an automated plate stiffener, part of the semi-automated steel fabrication process. At right, the 1,200 ton capacity "Goliath" crane lowers the entire bow section of a LNG tanker into place. Preoutift or "modular" construction allows entire pieces of the ship to be built and outfitted with all their equipment in a shop or assembly area away from the building slip, where work can be done most efficiently. The pieces, weighing anything from 150 tons to over 1,000 tons, are then installed on the ship by cranes. 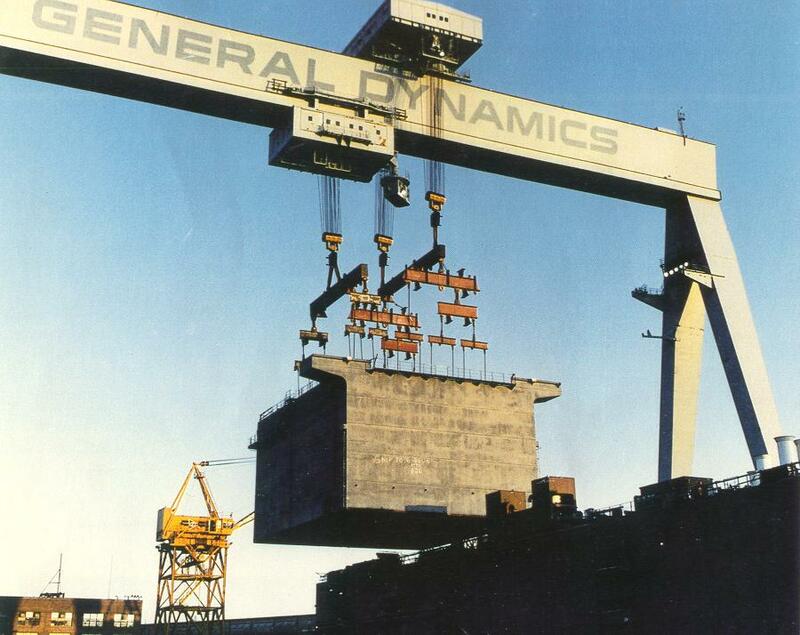 The 1,200 ton Goliath crane, part of General Dynamics' modernization of the facility, and largest shipbuilding crane on the continent, was a key to the use of very large preoutfit units, such as entire deckhouses, bows, and sterns. Under General Dynamics ownership, Quincy concentrated on large merchant and naval vessels, well suited to semi-automated and preoutfit construction techniques. 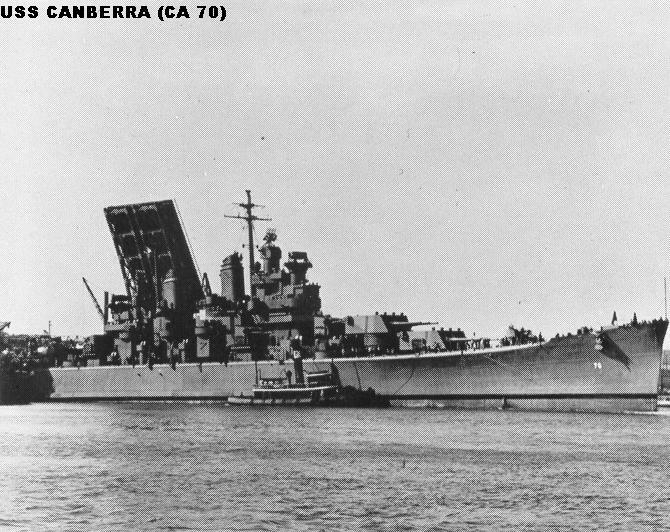 Naval construction included replenishment oilers, ammunition ships, submarine tenders, and amphibious ships such as USS Mount Vernon (LSD 39), at left. Quincy also constructed several nuclear powered submarines before that work was consolidated at General Dynamics' Electric Boat Division. 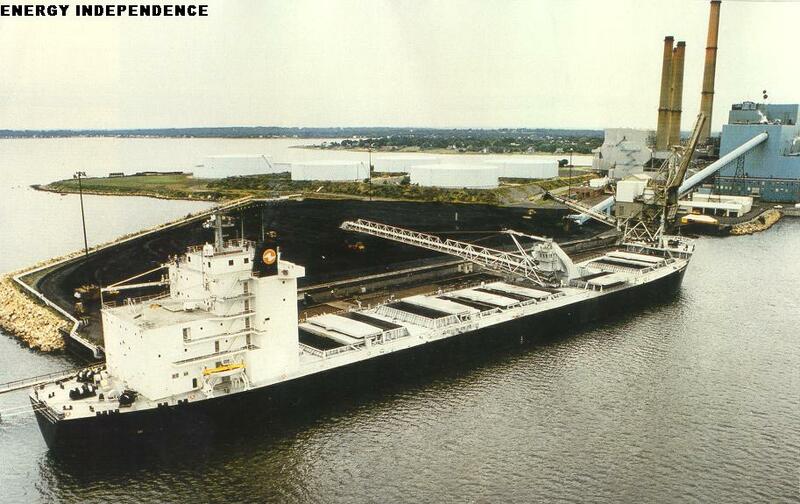 Merchant construction included large, but relatively complex ships, such as SeaBee barge carriers, roll-on/roll-off vehicle ships, and the innovative coal-fired self-unloading collier Energy Independence (right), designed to haul coal to New England power plants. 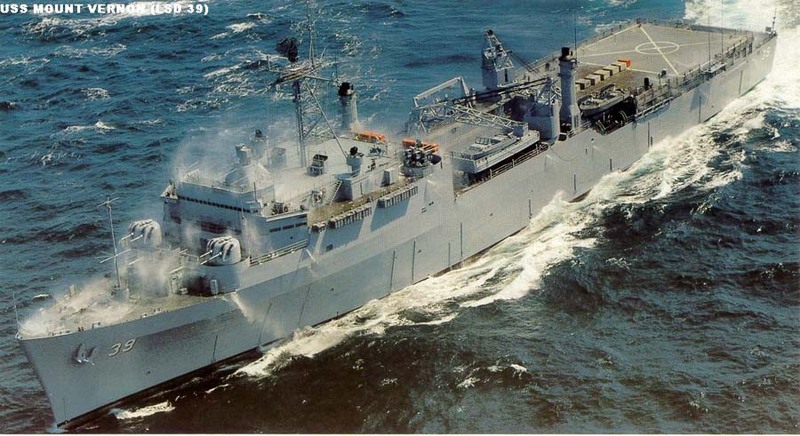 Quincy also did extensive overhaul, modernization, and conversion work for both military and commercial customers, including the complete reconstruction of the cable layer USNS Neptune (T-ARC 2), and the rebuilding of the tanker Overseas Boston. 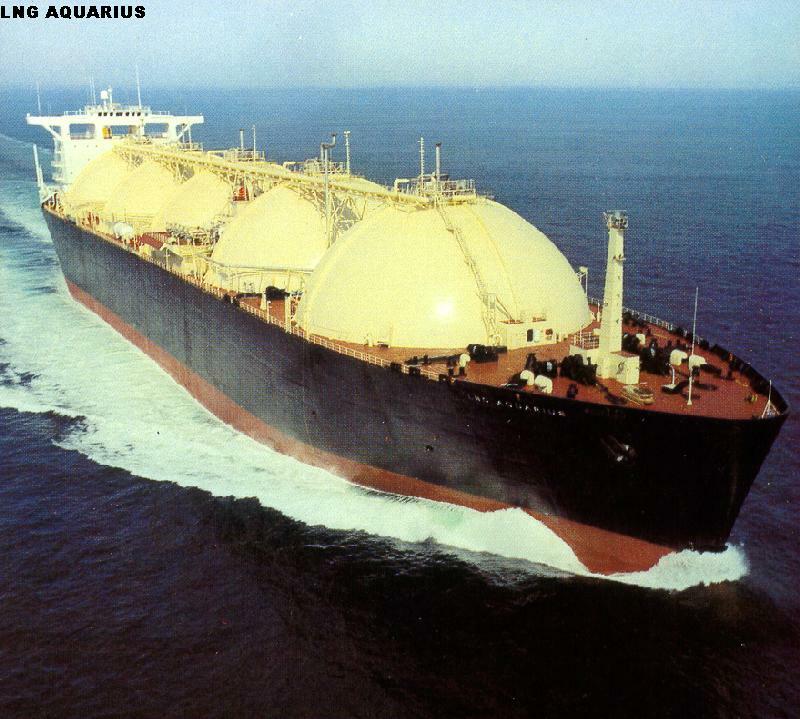 The major constructon program at Quincy from the mid-1970's to the early 1980's was the construction of 10 liquified natural gas (LNG) tankers. These massive ships, 936 feet long and displacing as much as a large aircraft carrier, transported 125,000 cubic meters of LNG in five 120 foot diameter cargo spheres. Preoutfit and "modular" construction were extensively employed in building the LNG tankers. The bow, stern, midbody, and deckhouse were constructed separately, then joined together at various stages of assembly. The huge, 750-ton cargo spheres were constructed in a specialized facility at Charleston, South Carolina (right), brought to Quincy on a special barge, and loaded aboard with the Goliath crane. 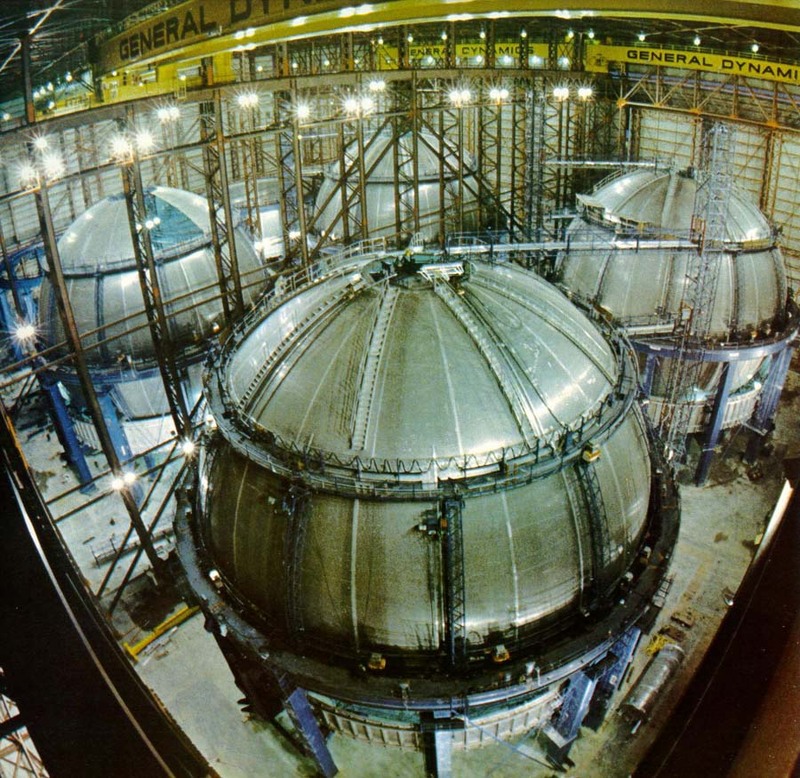 The complex compressor and cryogenic piping modules, and the sphere covers, were constructed at Quincy and loaded aboard after the spheres had been installed. 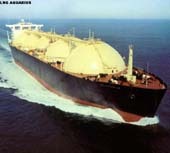 The Quincybuilt LNG tankers are regarded as highly successful ships, and remain in service today. Quincy's major project during the early- and mid-1980's was the construction of five Maritime Prepositioning Ships (MPS) for the US Navy. Each of these 42,000 ton ships was designed to carry all the equipment and supplies need to support 4,000 Marines in combat for 30 days. The cargo included not only the Marines' vehicles, but all the equipment, supplies, stores, spare parts, munitions, fuels, and water the troops would need. To accommodate this cargo, each ship featured 150,000 square feet of vehicle decks, over 1.6 million gallons of cargo tank capacity (200,000 gallons gasoline, 540,000 gallons diesel fuel, 855,000 gallons jet fuel, 82,000 gallons potable water), stowage for 433 drums of kerosene and lube oil, and space for 490 standard cargo containers, which provided 101,000 cubic feet for general cargo, 18,000 cubic feet for refrigerated cargo, and 230,000 cubic feet of munitions stowage. In addition to carrying this impressive loadout, the ships would have to put all the cargo ashore while anchored two miles offshore in 50-knot winds, a three-knot current, and five-foot seas. Accordingly, the ships were equipped with a stern ramp for amphibious vehicles, five 39-ton cranes, two LCM(8) landing craft, 11 lighters, a floating pipeline system, and a special anchoring system. Construction of these ships, although simpler than the LNG tankers, included one very notable feature. The massive deckhouses were constructed and outfitted off-ship, and were lifted in place by the Goliath crane. 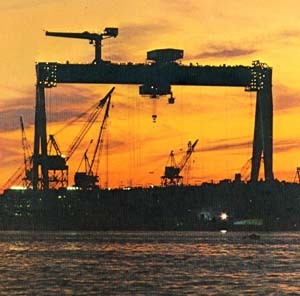 Weighing in at an incredible 1,120 tons, the MPS deckhouses were the heaviest shipyard lifts ever accomplished in the US. This heavyweight lift record still stands today. The five MPSs were delivered in 1985-86, and are stationed in key locations around the world, fully loaded and ready to sail for any trouble spot. With the completion of the MPS contract in 1986, Quincy's future looked bleak; there were simply too many shipyards and too few new ship orders. When Quincy failed to land contracts for U.S. Lines container ships and new survey ships for the Navy, the shipyard was doomed. 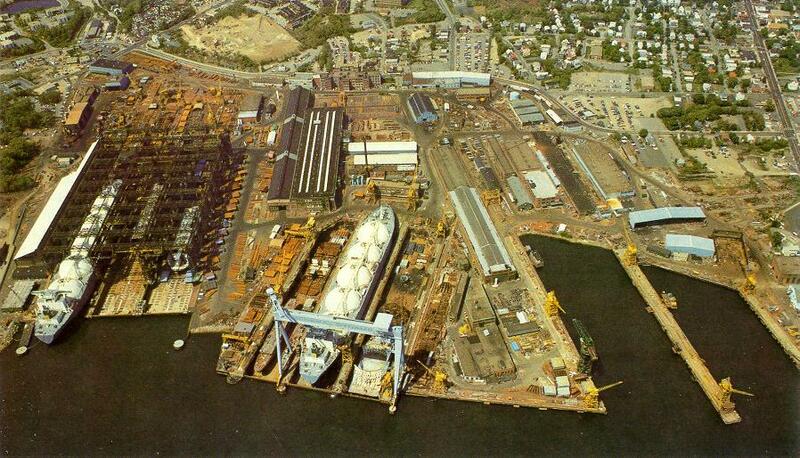 The yard was closed in 1986; the remaining employees were laid off or retired, and the shipyard lay idle for the first time in decades. At left is a view of the yard, taken in 1981 as the LNG program was coming to a close, showing the facility in essentially its final form. 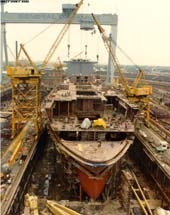 The wet basin and two construction basins are at left; the three assembly basins and the Goliath crane at center, and the fitting out piers at right. Following the closure the yard lay dormant for many years. Equipment was sold off; parts of the facility were used for staging areas for public works construction projects. A ship scrapping operation operated briefly at one end of the shipyard, but soon closed down. There have been many efforts to re-open and modernize the shipyard, but to date none has come to fruition. 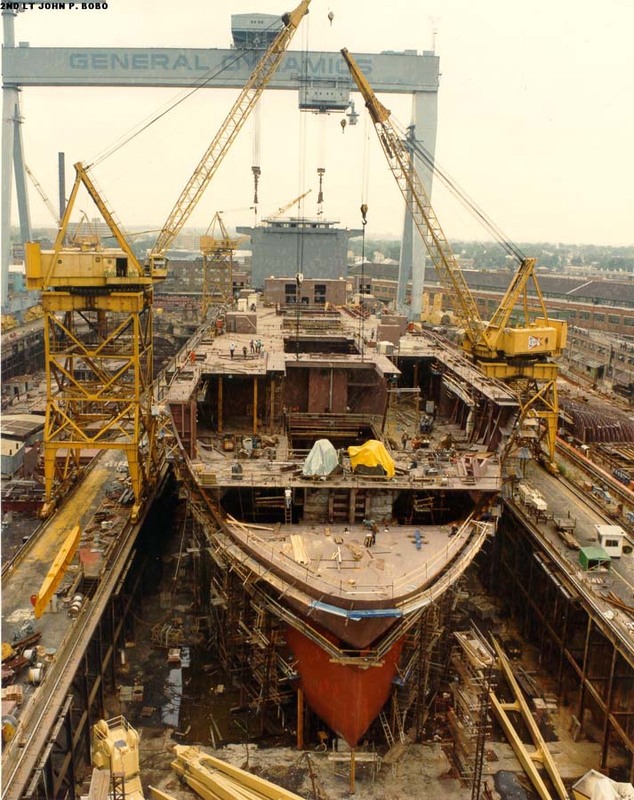 In 1994 the Quincybuilt cruiser Salem (CA 139) returned home to the Quincy yard, becoming the centerpiece of the United States Naval & Shipbuilding Museum. Today Salem is berthed at the same fitting-out pier where she was completed over 50 years ago.